PRESENTING some stories of interest from the past week . . .
Herefordshire firm’s lost Mickey Mouse prototype film auctioned: A lost Disney cartoon featuring what is thought to be the prototype Mickey Mouse character has been sold in the US for $25,000 (£16,000). Missing Doctor Who episodes discovered: Doctor Who fans are getting a fresh opportunity to travel back in time with the discovery of two missing episodes from the long-running BBC series. Also check out this piece about the recoveries over at the Radio Times. Alexander Graham Bell recordings played from 1880s: Alexander Graham Bell foresaw many things, including that people could someday talk over a telephone. Yet the inventor certainly never could have anticipated that his audio-recording experiments in a Washington, D.C., lab could be recovered 130 years later and played for a gathering of scientists, curators and journalists. You can hear some of the revived recordings here. Vinyl treasure found on Wake Island: In a tale straight from an adventure book, contractors here recently stumbled upon a vinyl record collection with an estimated value between $90,000 and $250,000. BFI to present restored rare Hitchcock films with new scores: As part of London 2012 festival, composers including Nitin Sawhney will work on new scores for early Hitchcock films. CLASSIC DOCTOR WHO adventure The Ambassadors of Death is set to be seen in colour for the first time in 40 years. Restoration experts are in the final stages of converting all seven episodes back from black and white, and hope to deliver the recolourised copies to the BBC “within weeks”. A DVD release of the 1970 story, starring Jon Pertwee as the Doctor, is expected to follow. Though originally made on two-inch colour videotape, six episodes of Ambassadors were only retained in the BBC archives as inferior 16mm b&w film recordings. New technology, however, has revealed that these and some other black-and-white telerecordings still retain information that can lead to the restoration of the missing colour. Steve Roberts of the Doctor Who Restoration Team, an independent group contracted by the BBC, has been overseeing the painstaking process of unpicking the colour signal and bringing one of the Time Lord’s vintage stories back to life. The technique, developed from an idea of James Insell, a preservation specialist at the BBC’s Windmill Road archives centre in west London, has already been successfully applied to episodes of Dad’s Army, Are You Being Served? and another Doctor Who story – episode three of Planet of the Daleks. But recolouring episodes 2 – 7 of The Ambassadors of Death (tx March 21 – May 2, 1970) has proven the Restoration Team’s biggest challenge to date. With much dedication and skill, team member Richard Russell used the weak signal on the films, appearing as a pattern of faint ‘chroma’ dots, to reverse-engineer raw colour pictures that could then be retouched frame by frame. “It’s very, very labour intensive – several hundred man hours’ work every episode,” said Roberts, who is the team’s supervisor and a BBC senior engineer. He adds that a new “quadrant editor” is helping them to produce better source material upfront and that they hope to deliver the Ambassadors episodes to the BBC “within weeks”. A DVD release is expected to follow, though it is not currently on schedule for 2011. Prior to 1978, the BBC junked many vintage episodes of Doctor Who featuring actors William Hartnell, Patrick Troughton and Jon Pertwee in the lead role. Today, 108 episodes are missing. Episode one of Ambassadors is the oldest episode of Who surviving on its original transmission tape. 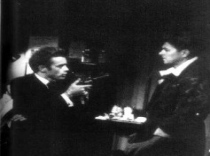 The only remaining copies of the other six episodes were b&w film recordings and poor-quality domestic colour NTSC recordings made from a US broadcast in 1977 and severely affected by a rainbow-coloured pattern of interference. Now that Ambassadors has been restored, only seven episodes from the Pertwee era remain in black and white (The Mind of Evil 1 -6 and Invasion of the Dinosaurs 1). READ ON: Read the original Wired story – Time-travel TV: The mission to regenerate Doctor Who in colour. The Doctor Who News Page has also covered the announcement – The Ambassadors of Death DVD developments. Learn more about the colour restoration process on Wikipedia. A trove of 75 ‘lost’ silent American films – including an early movie from acclaimed director John Ford – has been discovered in New Zealand. The New Zealand Film Archive and the National Film Preservation Foundation announced today (June 7) a partnership to preserve and make available the astonishing collection – that have been unseen anywhere in decades. Heading the list is John Ford’s full-length feature Upstream (1927), a backstage romance involving an aspiring Shakespearian actor and the daring target girl from a knife-throwing act. Silence Is Golden: A still from the recovered trailer for John Ford's "Strong Boy". Only about 15% of silent-era films by the four-time Academy Award-winning director are thought to survive. 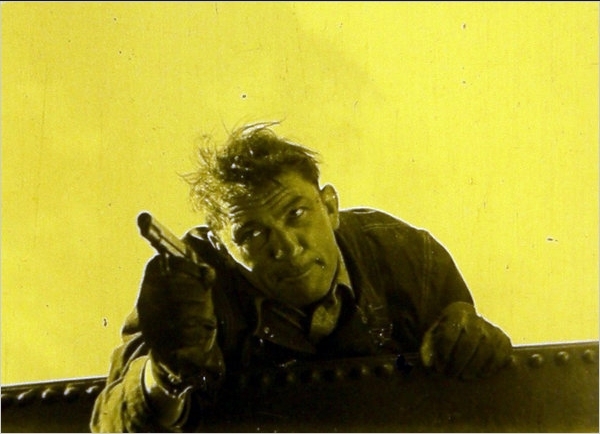 The collection also includes another important Ford find—a trailer for the director’s lost feature Strong Boy (1929), starring Victor McLaglen. “Upstream is a major discovery that illuminates a previously lost page of John Ford’s early years at Fox,” said Matthew Bernstein, Chairman of the Emory University’s Film Studies Department and co-editor of John Ford Made Westerns. Among the other important finds are Maytime (1923), an early feature with Clara Bow; the first surviving film directed by and starring Mabel Normand; an episode of the popular serial The Active Life of Dolly of the Dailies, starring Mary Fuller as the unstoppable woman reporter; Westerns made in Tucson, San Antonio, and Yosemite; the only known narrative feature showcasing the Miller Brothers Wild West Show; comic shorts starring Charles Puffy, Snub Pollard, and Joe Murphy; an industrial film about the making of Stetson hats; and a number of documentaries and newsreels. The films date from as early as 1898. About 70% of the nitrate prints are virtually complete, and more than two-thirds have color tinting. Taken together, the films are a time capsule of American film production from the 1910s and 1920s. The “lost” films will be preserved over the next three years and accessed through the five major American silent film archives: the Academy of Motion Picture Arts and Sciences, George Eastman House, the Library of Congress, the Museum of Modern Art, and the UCLA Film & Television Archive, which are collaborating with the NFPF on this project. Copies of the complete films will also be publicly available in New Zealand and viewable on the NFPF Web site (filmpreservation.org). Only a fraction of the American films created during the first four decades of the motion picture still survive in the United States—probably fewer than 20%. American silent films, however, had a worldwide popularity, and many works discarded in the United States survive abroad as distribution prints that were salvaged decades ago at the end of theatrical runs. The Library of Congress has estimated that roughly one-third of American silent-era features that survive in complete form exist only in archives in other countries. “We are delighted to collaborate with the NFPF to preserve and make available these notable films,” said Jamie Lean, Division Director, the New Zealand Film Archive. For more information, check out a story on The New York Times (including slide show), and another on The Telegraph. EACH WEEK Wiped will be bringing you the best of the rest: smaller stories that might have passed you by, but are worth checking out all the same. 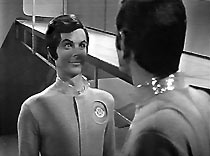 Also posted are the few remaining clips from ‘The Caves of Steel’ (tx 4/5/64), a BBC adaptation of Isaac Asimov’s novel of the same name. Broadcast as part of BBC2’s anthology strand Story Parade, this 75-minute production was adapted by Terry Nation and starred Peter Cushing. It’s success led story editor Irene Shubik to devise Out of the Unknown. For a full list of surviving OOTU material, visit this highly informative Out of the Unknown Clips Guide. Last week, news sites were awash with a story concerning the ‘discovery’ of a 1950s’ American TV show featuring tragic Hollywood icon James Dean and future American president Ronald Reagan. To cut to the chase, this is a non-news story. The “newly discovered” 23-minute drama ‘The Dark, Dark Hours (broadcast on CBS network’s General Electric Theatre on Dec 12, 1954 is already available on DVD! (see this post on excellent forum Britmovie.co.uk). I guess it boils down to the same old story of semantics and strong headlines getting in the way of the facts. Still, if you bear that in mind, it is a good yarn. Kino International has launched a website for The Complete Metropolis, which is coming to theatres in the US this summer ahead of home release. The newly extended version of Fritz Lang’s seminal 1927 sci-fi film follows the discovery, in 2008, of 25 minutes’ worth of lost footage in a film museum in Buenos Aires, Argentina. 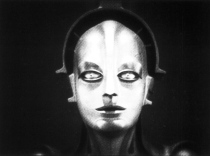 Kino’s comprehensive site includes restoration clips and trailers for The Complete Metropolis along with articles on the long journey to reconstruct the silent masterpiece. A LONG-LOST silent movie about President Lincoln is to get its first screening in over 90 years after being discovered in a clear out. When Lincoln Paid was among seven fragile reels of nitrate film found by a contractor cleaning out an old barn in Nelson, New Hampshire, destined for demolition. The 30-minute movie is particularly notable for starring and being directed by Francis Ford – older brother of celebrated film director John Ford. Massie found the film canisters in summer 2006 and temporarily stored them in his basement, before contacting a film society at nearby Keene State College. The George Eastman House film preservation museum in Rochester, N.Y., became involved after Keene State Film professor Larry Benaquist recognised the historical and cultural significance of the material. The college determined that the film did not exist in film archives and furthermore was the only one of eight silent films starring Ford as Lincoln to survive. “The vast majority of silent films, particularly from the early period — the first decade of the 20th century — are gone,” said Caroline Frick Page, curator of motion pictures at George Eastman House. With a grant from the National Film Preservation Foundation, the college was able to restore the two-reel film in a Colorado lab – a delicate process which took a year to complete. The images themselves were well-preserved, likely due to cold New Hampshire winters and the sheltered location of the barn, said Benaquist. But the 35mm nitrate film, phased out of Hollywood during the 1950s due to its volatile, flammable nature, was shrunken, brittle and damaged, with the sprocket holes (used on projectors) shredded. “What the laboratory had to do was remanufacture the sprocket holes to a new dimension, make it in strips, adhere it to the image, and then run it through a printing process where they would print it, frame by frame,” Benaquist said. When Lincoln Paid – about the mother of a dead Union soldier asking President Lincoln to pardon a Confederate soldier she had turned in — stars the brother of John Ford, the legendary director of classics such as The Searchers, The Grapes of Wrath and The Quiet Man. Benaquist thinks the film was discovered in Nelson because the town is on Granite Lake, the site of many past summer camps. He explained that a boys’ camp was in the area of the barn and that he believes the films were once shown to entertain the children before being shelved and forgotten. Helping the restoration was Mark Reinhart, author of Abraham Lincoln on Screen. He had a poor video copy of the film made from an 8mm copy that included a few scenes missing from the 35mm print. The college combined a DVD of the restored film with another of Reinhart’s film to make its final version, to be screened on April 20th. Released in 1913, the film was praised by Moving Picture World – a weekly trade publication for film distributors – as “a great war drama” with vivid battle scenes. Director and main star Francis Ford, who died in 1953, aged 72, is better known for minor, mostly comic roles in at least 30 of his younger brother’s films, “often playing a coonskin drunk who can spit across the room,” said Tag Gallagher, author of the book John Ford. “If you’re into these things, you quickly recognize him and it becomes a kind of cult thing to finding him, and he’s quite delightful,” said Gallagher. According to Gallagher, Francis Ford had an important influence on John, whose fame soon overshadowed his. During the silent-era, Francis Ford was one of many actors who portrayed Lincoln on film. “He’s not a particularly good Lincoln, he’s kind of short and stocky,” said Reinhart, who prefers the portrayals of Ford’s contemporaries, Frank McGlynn and Benjamin Chapin. A WORDPRESS neighbour of wipednews.com has helped restore the correct audio to a brief clip from one of the missing episodes of Doctor Who. Blogger Rumpio came to realize the fragment of grainy b&w footage – part of a 15-minute silent 8mm film reel of off-screen footage shot by a Who fan in Australia in the 1960s – was incorrectly synced with an off-air audio recording while working on a reconstruction of the two missing episodes (four and five, of six) of Season One’s The Reign of Terror. It was assumed that in the brief clip – from “The Tyrant of France” (tx 29/8/64) – companion Ian Chesterton mentions a character called Jules Renan. That is the way it appears on 2|entertain DVD Lost in Time, which also includes the rest of the 8mm clips capturing precious seconds from missing William Hartnell and Patrick Troughton episodes, coupled to their respective soundtracks. Rumpio, however, has managed to pinpoint the exact placing of the clip using “limited lipreading skills” to work out Ian was, in fact, saying something that sounded like “cheese”. I’ll leave the rest of the explaining up to Rumpio himself over at Rumpio’s Blog, but he’s shared his resynced version on YouTube, which you can enjoy below. THE FIRST two seasons of The Avengers have been released by Optimum in what has to be the most comprehensive DVD release yet. Including all that remains of season one (1961) and the entirety of season two – which saw the arrival of Honor Blackman as Cathy Gale – the eight-disc digitally restored DVD set also boasts a huge wealth of extras. Of particular interest to missing episode enthusiasts will be the inclusion of recently discovered telesnaps from missing season one episodes. Telesnaps are sets off-screen photos taken off the TV during original transmission. The inventor, John Cura, captured many shows in this way, famously including Doctor Who. Thanks to him, and Avengers producer Leonard White for saving them in scrap books, fans can at last get a real idea of the visual feel of a significant number of missing season one episodes, including Dead of Winter (tx 9/12/61). Exclusive audio commentary by Producer Leonard White on the surviving footage from the opening episode, “Hot Snow”. Police Surgeon – “Easy Money” (tx 10/09/60) – starring Ian Hendry. The only surviving opening episode of the series that is regarded as the precursor to The Avengers. Filmed introduction to Police Surgeon by Producer Leonard White. Exclusive, newly filmed interview with Honor Blackman. Exclusive audio commentary by writer Martin Woodhouse on “Mr Teddy Bear”. Exclusive audio commentary by Producer Leonard White on “The Mauritius Penny”. Exclusive audio commentary by writer Roger Marshall on “Death of A Great Dane”. Exclusive audio commentary by actress Julie Stevens on “A Chorus of Frogs”. Filmed introductions by actress Julie Stevens. Insert reprint of original publicity brochure for the first Honor Blackman season. Insert reprints of Leonard White’s scrapbooks featuring telesnaps of lost Series 1 episodes. PDF material: original scripts, TV Crimebusters comic strip, TV Times covers (for Police Surgeon and The Avengers), a ‘knit with The Avengers’ feature from Woman’s Mirror featuring Hendry and Ingrid Hafner, and music cue sheets. Extensive stills galleries featuring both b&w and colour promotional stills and behind=the-scenes photos. 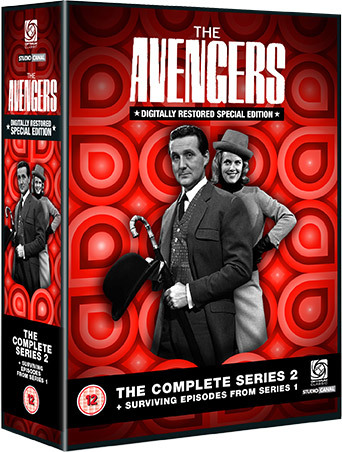 The Avengers: The Complete Series 2 & Surviving Episodes From Series 1 has a RRP of £79.99 but you can find it cheaper from websites including Play.com (£57.99). There are good reviews of the release on the Television Heaven website and at Cathode Ray Tube. TV Times covers (for Police Surgeon and The Avengers), a ‘knit with The Avengers’ feature from Woman’s Mirror featuring Hendry and Hafner modelling some choice knitwear and music cue sheets. Site banner kindly created by Scott Burditt. Doomwatch - Series 1 from Simply Media on Vimeo. You Think File Sharing is All Bad? Well, Rats To You!